Content creators will love the dedicated NVIDIA GeForce GTX 1050 (upgrade) for running Adobe Creative apps. 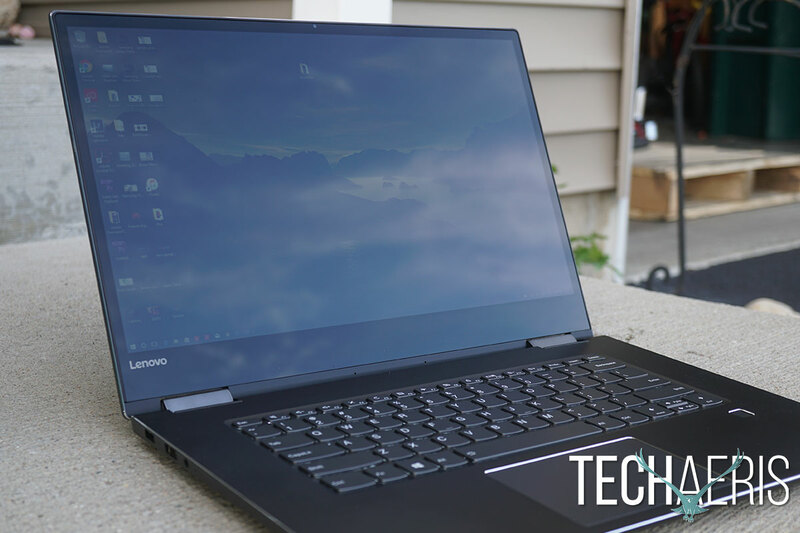 I feel like it was just a few months ago that I reviewed the Lenovo Yoga 710, a laptop that I thoroughly enjoyed using during the review period I had it. Now, Lenovo is back with the Lenovo Yoga 720 and this machine is ever so slightly better than the outgoing 710. The JBL sound system remains as does the premium design and look. The signature Yoga versatility also remains along with a great user experience. 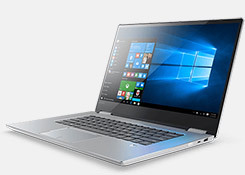 Where the Lenovo Yoga 720 ups the game is with a newer NVIDIA GeForce GTX1050 and 7th gen Intel Core i7 chips. 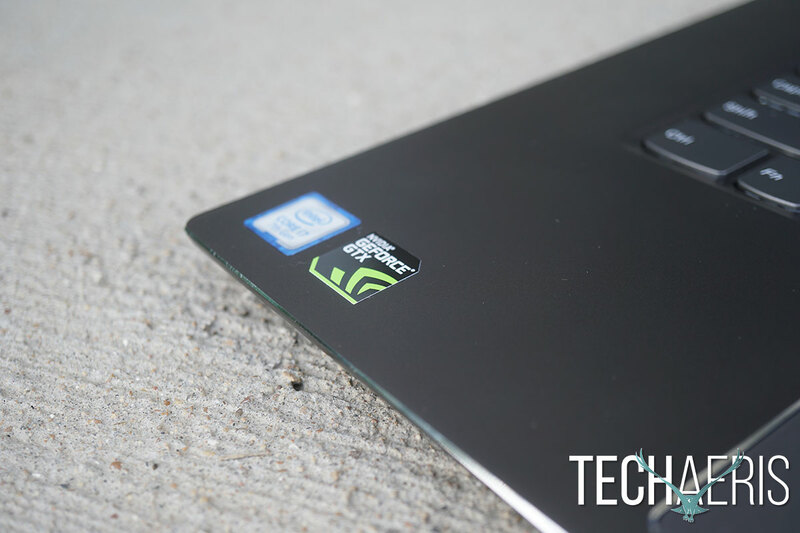 This is a powerhouse performing laptop, especially for content creators and it retains that same great look. 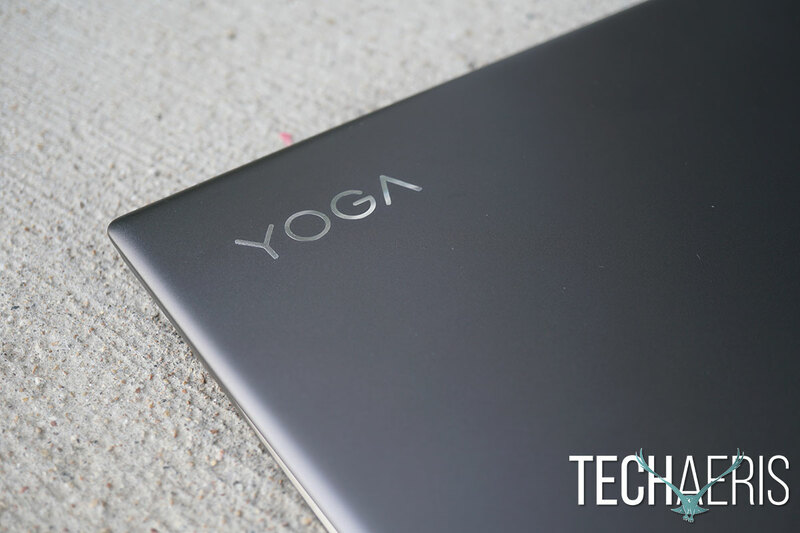 Read on for the full review on the Top Pick Award-winning, Lenovo Yoga 720. The Lenovo Yoga 720 shares some of its design cues with the Lenovo 710 with some subtle changes. That’s not unusual and it’s not bad since the Lenovo 710 was also an excellent machine. You’re still faced with an aluminum body, which is pretty heavy, and super premium materials. The 720 is actually heavier than the 710, not by a lot but it’s worth noting. The bottom of the laptop has a long venting slate which should push heat out of the laptop well. Setting the laptop down on a bed or other surface does block this ventilation and the fans do tend to kick on a bit more often. There is another venting slate along the backside of the Lenovo Yoga 720 which also helps move hot air away from your CPU/GPU. Rear vent helps move heat away from CPU/GPU. 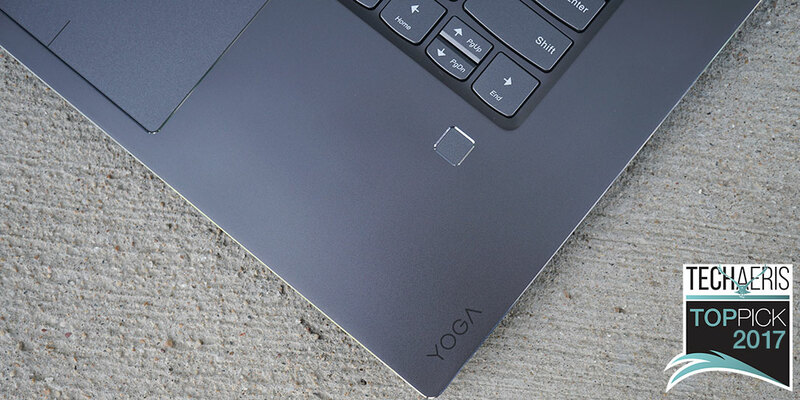 The top of the Lenovo Yoga 720 still has the Yoga logo emblazoned on it. It’s not gaudy and done in good taste, as well as branding can be done. Along the right edge of the 720, you have the power button, one USB-C/Thunderbolt 3 port, and one USB 3.0 port. 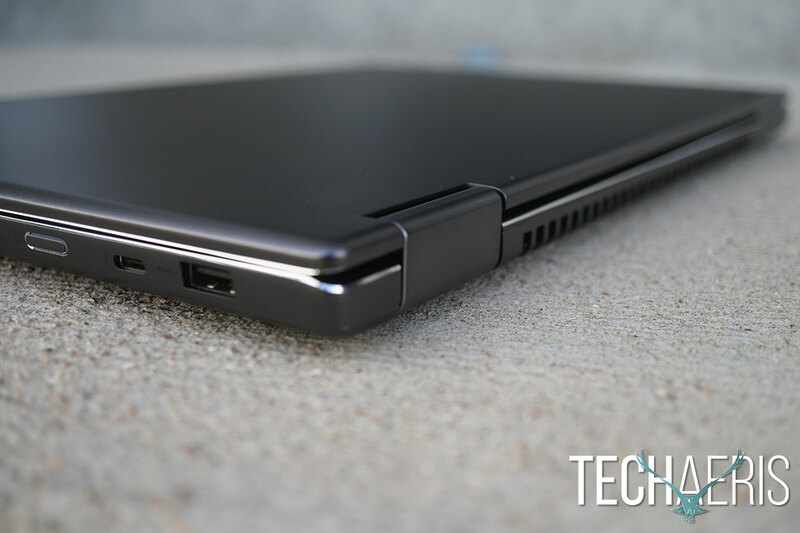 Along the right edge of the laptop, you’ll find the headphone jack, USB 3.0 port, and the priority power port. Ports are probably one of the biggest design differences from the 710. Gone is the Micro HDMI, 4-in-1 SD card reader, and DisplayPort, leaving you with just 2 USB 3.0 ports and one Type-C/Thunderbolt 3 port. More PC makers are dropping legacy I/O in favor of USB-C and USB 3.0 so this isn’t unexpected. Opening up the laptop you’re greeted by the expansive 15.6″ FHD edgeless display as well as the keyboard, trackpad, and fingerprint reader. The keyboard is even better than the 710, it has the same low impact soft typing experience and the travel feels shorter. The keyboard is backlit, which should just be a standard offering on any laptop these days. 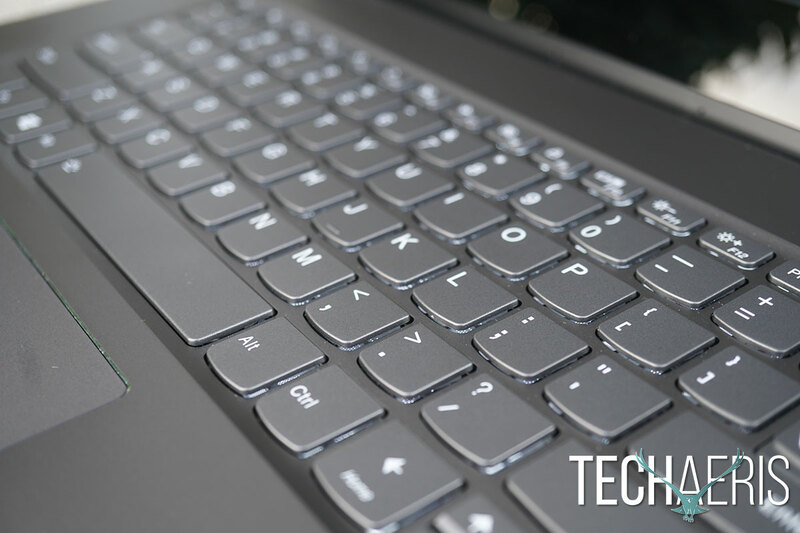 Lenovo laptop keyboards have improved every year and the Lenovo Yoga 720 keyboard is one of the best I’ve used, very comfortable to use (full-size shift keys left and right). NVIDIA graphics are great for content creators. 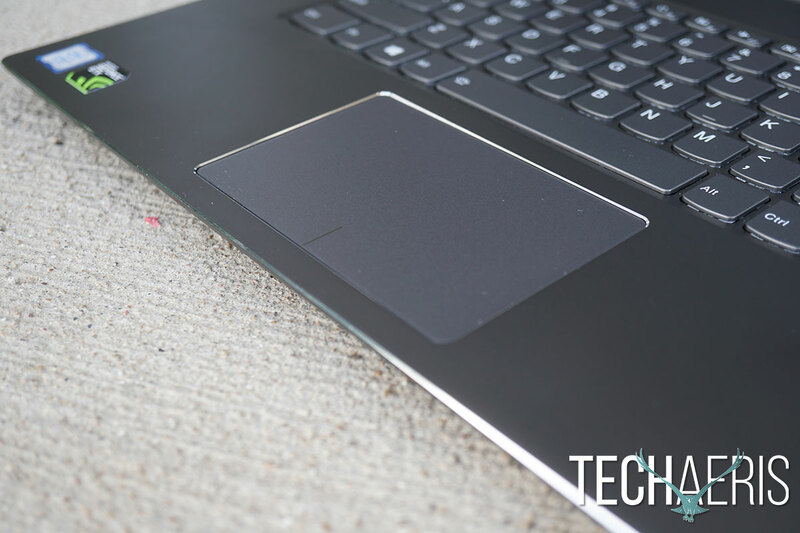 I’ve been critical about Lenovo’s trackpads in the past and they have been improving. I’m pleased to say that the improvement continues. 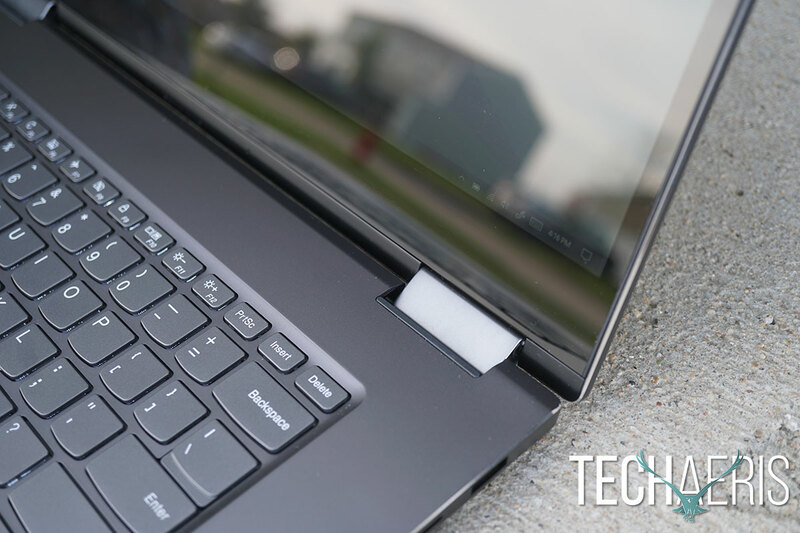 The Lenovo Yoga 720 trackpad is silky, smooth, and overall pleasant to use. I still believe Apple holds the advantage in the trackpad category but dammit, Lenovo is really doing a fine job of making it better. The fingerprint scanner is pretty much in the same place and still works as fast as I remember. I’m into Windows 10 within a half second of placing my finger on the scanner, really effective. The Lenovo Yoga 720 also comes with JBL speakers, which are located on the bottom (more on that in the sound category). Overall the design is what I expected given that this is a follow-up to the Lenovo Yoga 710. It’s robust, well built, good materials, and feels like your money was well spent. It may be a little bit heavy for some users, keep in mind it starts at 4.4lbs depending on configuration. Viewing angles in bright light can be a challenge. I wish this panel went beyond 280 nits. The standard display on the Lenovo Yoga 720 is a 1920×1080 FHD panel but you can upgrade to a 3840×2160 UHD display. Seriously, the FHD panel is really all most users will need. Unless you want to consume 4K content or do major photo and video editing, the standard display is really a great display. The edgeless display isn’t really edgeless as there are some slight bezels on the left, right and top. I don’t mind this, especially since I prefer the webcam to be at the top and not the bottom like other edgeless laptops. Speaking of the bottom, the 720 retains the larger bottom bezel of the 710. I feel this bezel should be cut down a bit more, it’s not a deal breaker but aesthetically I’d just like a more proportionate look between the bezels. The screen brightness has been upped on this model from 250 to 280 nits but it’s still not enough for my taste. Apple’s laptops can reach up to 500 nits and other PC laptops can go over 300 nits. While it’s not a dealbreaker, a higher nit output would be something I’d like to see Lenovo work on for this model. The Lenovo Yoga 720 does suffer from glare and poor viewing angles in really bright light, the same complaints I had with the 710. The bottom bezel is huge. Laptop mode: This mode is exactly what it says, laptop. Tent mode: This mode allows you to stand the Lenovo Yoga 720 on its display and keyboard edge to use it on a table or desk without the keyboard. Great for looking at recipes or consuming content. Display mode: This mode allows you to turn the keyboard down into a stand position allowing you to display the content on the screen to someone across the table from you. Very much like tent mode but just standing differently. Tablet mode: This mode is exactly what it says, turn this into a giant 15.6″ tablet that weighs nearly 5 pounds. The touch panel here is pretty spot on, touches registered well, scrolling was smooth, and other gestures worked as expected. The high-gloss screen does like to show fingerprints if you use the touch aspect a lot, just something to keep in mind. Colors are vibrant and overall pretty accurate. Nothing is oversaturated and everything felt natural and the blacks were pretty great as well, deep and contrasty. The whites were spot on too, reading text felt good and natural, nothing felt yellow or offwhite. Overall, this panel is solid and the bump in nits from the 710 is good. I do wish it went brighter but that could just be a personal preference and not bother others. Yoga branding on the lid. Windows 10 Home 64 is what you’ll get on your Lenovo Yoga 720. There’s not much to say about Windows 10, I think most have gotten used to it and it’s really the best Windows version yet. The OS is really great for touch-enabled devices like the Yoga which can take advantage of gestures and touch features other OS’s can’t. Lenovo has improved its bloatware situation as well. There are a few Lenovo based apps pre-installed which you can remove. The one major offending piece of software that continues to be pre-installed is McAfee. Of course, it’s not just Lenovo that partners with McAfee and Norton, many other PC makers do the same. I just wish they wouldn’t. Our review unit came with the 7th generation Intel Core i7-7700HQ CPU and an Intel HD 630 GPU plus a dedicated NVIDIA GeForce GTX 1050 and 8GB of RAM. In a nutshell, this is a great performing machine with this configuration. 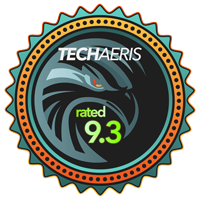 It excels in general use, such as web browsing, email, office work, YouTube, Netflix and content consumption. The dedicated NVIDIA graphics will really help content creators who use video and photo editing apps. I was able to edit 4K video in Adobe Premiere without issue. The fans did kick in to cool the GPU but that’s not unusual given the processing load 4K video editing has on the GPU. The Lenovo Yoga 720 is not a gaming laptop but with the NVIDIA it can handle some light gaming if you’re bored. Overall the performance here is top notch. I’d say professionals who require heavy processing and rendering should be looking into the Core i7 with NVIDIA graphics. General users can most likely live with a Core i5 and integrated Intel HD graphics but make sure to get a minimum of 8GB of RAM. I would also recommend a bump to 16GB of RAM for pro users. Lenovo trackpads have gotten so much better. JBL speakers come standard on the Lenovo Yoga 720 but once again, they’re on the bottom! I really wish Lenovo would have put these on the top flanking the keyboard. The speakers don’t sound horrible so why down fire them? The JBL sound is pretty decent here but not so great in laptop mode and tablet mode. The sound is better in tent and display mode where the speakers aren’t as obstructed. Lenovo tried to place them on the part of the laptop that curves up so they’re not so obscured, but they are. Speakers on top for the Lenovo Yoga 730 please, thanks! The 720p webcam is your standard front-facing webcam. It will do the job but I wouldn’t use it for selfie shots. I do think it could be improved to 1080p with a bit more megapixels added. I’m not a huge webcam user though so the included webcam is fine by me. Lenovo says you should get up to 9-hours of battery with the FHD display, I found this to be generally true in general use. I had no problem getting 8-9 hours of use under normal loads, web browsing, email, some media consumption. You will see battery drop like a stone if you’re video editing or photo editing. That is to be expected given the processing requirements for those tasks. So battery life will really depend on what you’re doing, the screen brightness, and even listening to audio. The hinges on the 720 are solid and well built. Starting at $1499USD this could be a bit pricey for some. But there is value in the performance, build quality, and user experience here. 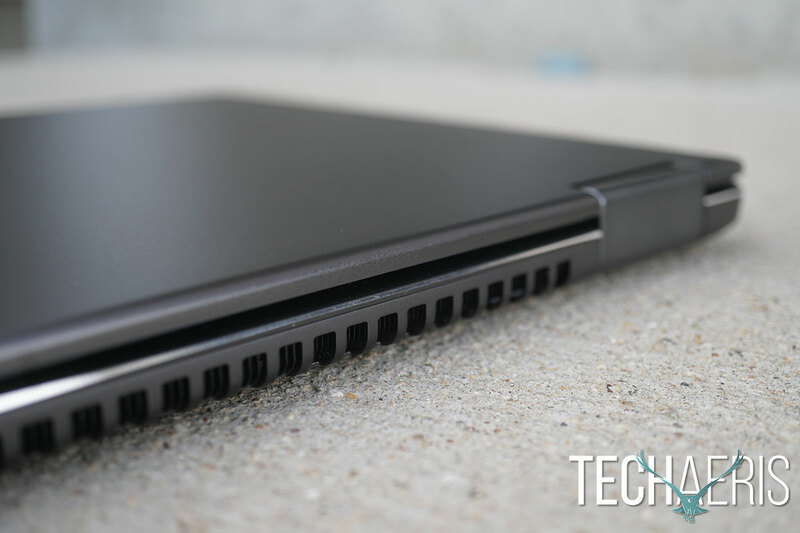 *We were sent a review unit of the Lenovo Yoga 720 for the purposes of this review.